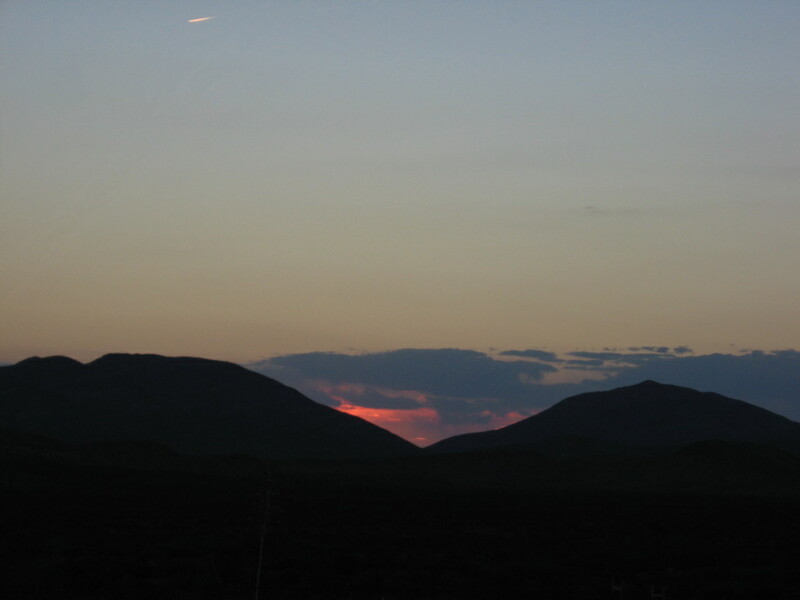 Today we left the Chihuahuan Desert for the Sonoran. The sharp outlines of the Chisos Mountains drew into view. 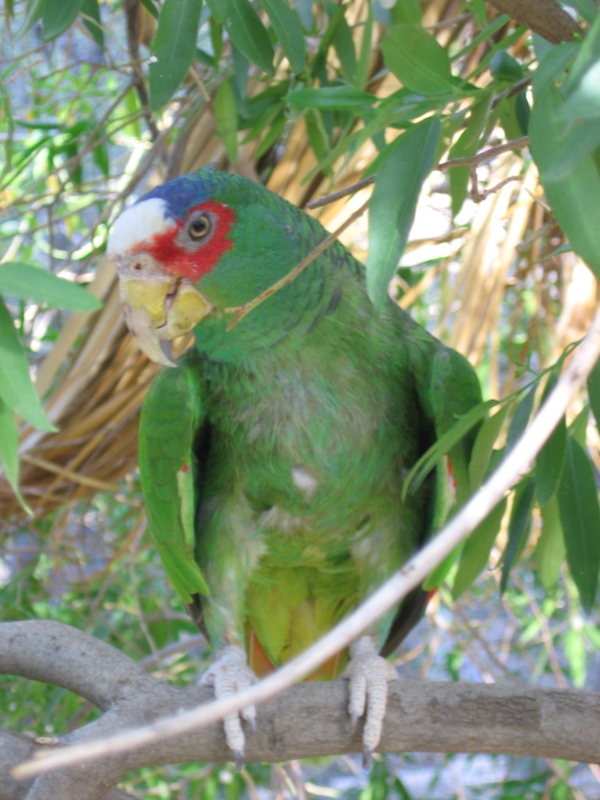 We stopped at the Arizona Sonoran Desert Museum, a fantastic place full of displays, live and informative about the flora and fauna that make the Sonoran Desert their home. A "living museum," most of it is outside, without walls or fences, so one shouldn't be surprised if a sidewinder saunters by. The museum explores the many aspects of desert life, from scrub, to oases, to caves. 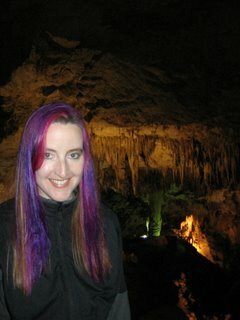 They even have a little human-made cave you can explore, which was pretty darn neat, even after exploring Carlsbad. 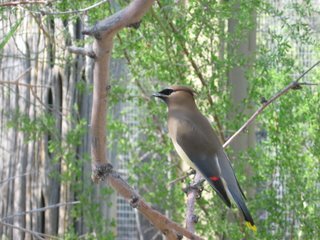 An aviary holds many types of Sonoran Desert birds, including the Bohemian Waxwing, one of my favorites, and the striking thick-billed parrot. 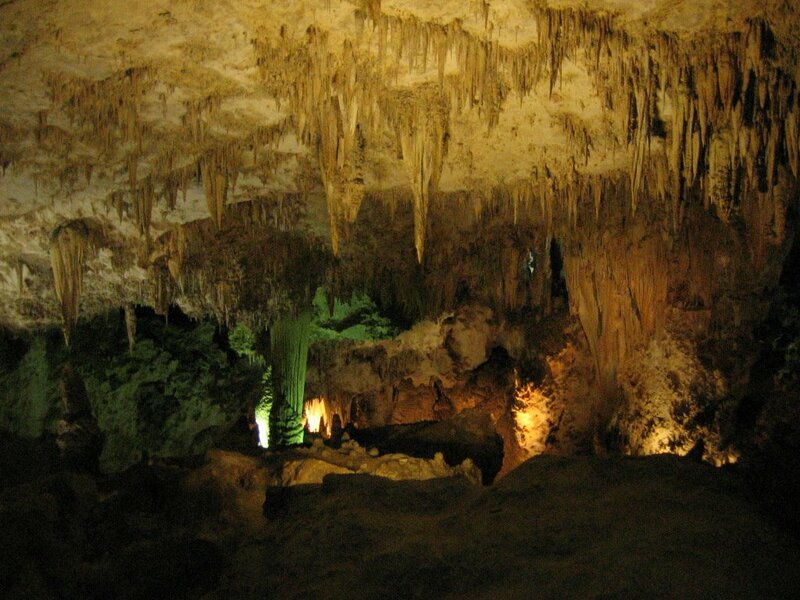 The cool underground cave leads to an exhibit on the history of the earth and moon, the evolution of the planet, and the prehistoric creatures that left their fossils in the present-day desert. A striking display of minerals held us raptly, vivid reds, blues, and golds against black velvet. There's a section where one can dig for fossils, and we did. 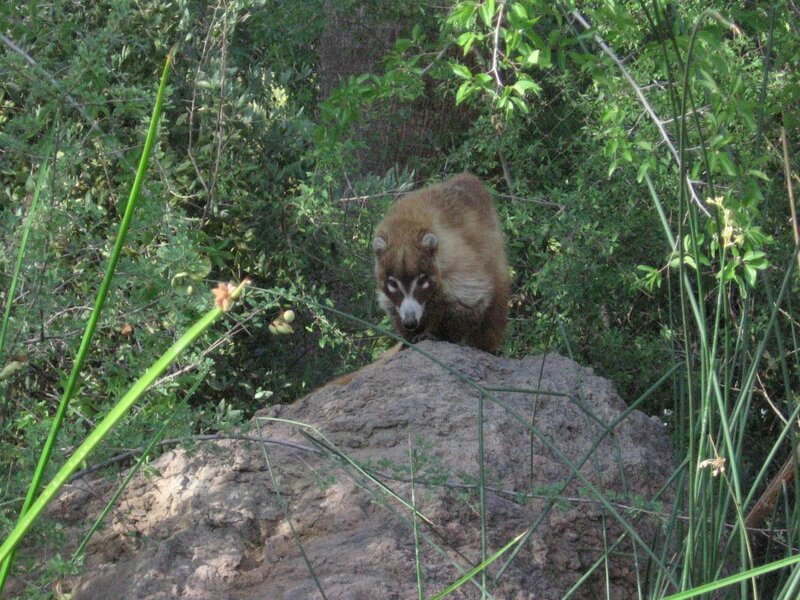 One of the highlights for me was seeing a coati, which I had never seen before then. 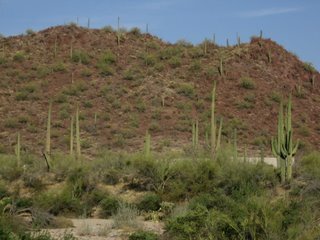 We continued on to Saguaro National Park, seeing the famous cacti lit by the setting sun. 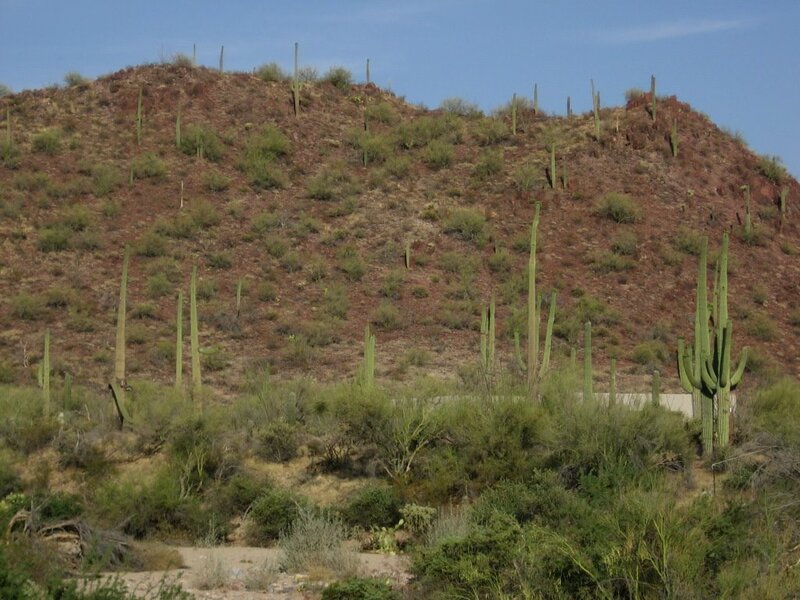 The vivid red of the Red Hills district was bright against the green of the saguaro. As the sun set, we continued west, this time to return to the bay area. Thank you for reading of my journeys! Today we hiked down into the natural entrance to Carlsbad Caverns. Cave swallows dived and twittered and fed their young in the huge rock faces leading down to the dark opening. We hiked down into the subterranean depths, walking by the branch of Carlsbad that leads to the Bat Cave, where the colony of Mexican free-tails spends the summer months. The branch-off is in what they call the "twilight zone" of the cave, where enough natural light still filters in for one to see without a flashlight. Here we veered off, heading down, down, 750 feet under the earth. 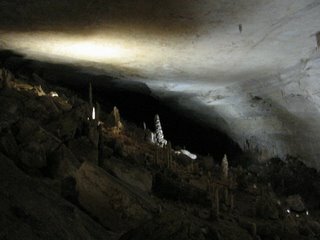 It's hard to express the sheer immensity of the cave -- the deep silence and stillness broken only by the occasional drip or trickle of water; the chill air, alive with moisture, and the wonder of the many glistening and strange formations. I imagine growing up in a cave, never seeing the outside, and how alien the upstairs world would seem -- beyond imagining while down in those dark depths, navigating narrow paths between cave pools and towering columns. The thought of a sunlit, grassy world with mountains and trees and a vast blue sky would seem like a fantasy world. Thinking of morlocks, I descended farther, seeing strange faces in the formations. Apparently I'm not the only one, though - the so-called Whale's Mouth is one of the coolest formations we encountered. Looking up at it from a lower point in an absolutely gigantic open room, I could clearly see a behemothic baleen whale, lips parted and eye glistening, trolling for prey. 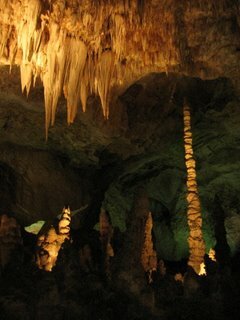 After passing through one of the tallest sections of the cavern, we entered the stunning Green Lake Room and just stood in awe of all the stalactites, columns and draperies. After leaving the cave, we opted to participate in the Adopt-A-Bat program in the park, which gives money to support research to protect bats and encourage education about our chiropteran friends. 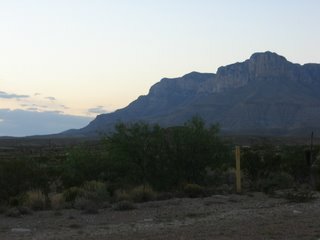 We drove farther west, reaching Guadalupe Mountains National Park just before dusk. 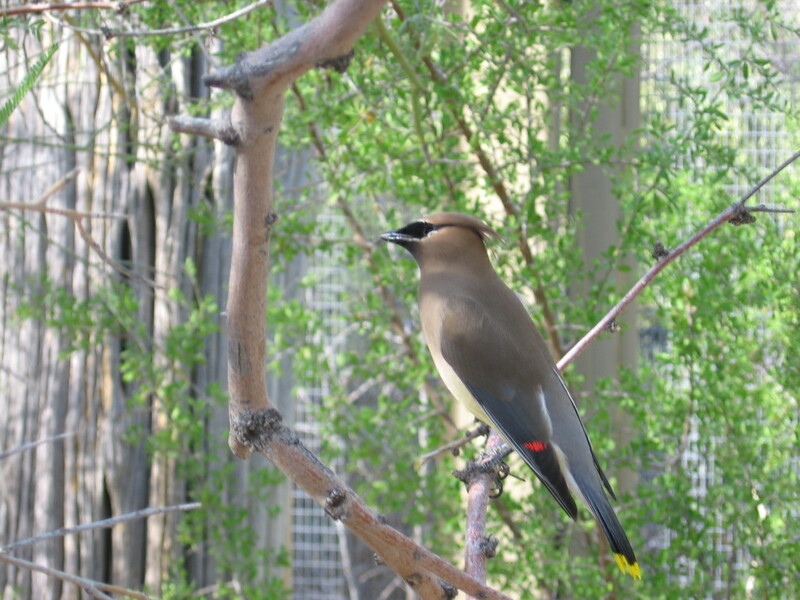 Birds sang and flew from bush to bush -- goldfinches, mockingbirds. Rabbits munched their dinners. 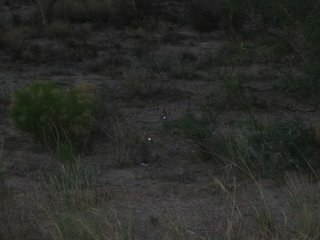 I don't know if you've seen the film Night of the Lepus, about giant killer rabbits rampaging through the desert southwest, but the rabbits I snapped a picture of may be related...eeeek! 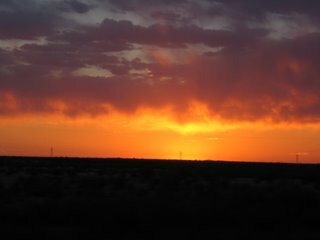 Another gorgeous sunset, this time over the Guadalupe Mountains, left us in awe. Tomorrow...on to the Sonoran Desert and those famous cacti, the saguaro. 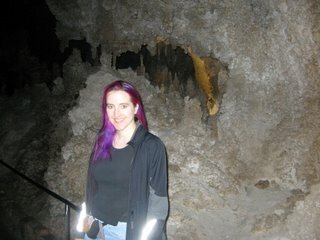 Western Trip - Day Five - Carlsbad Caverns! 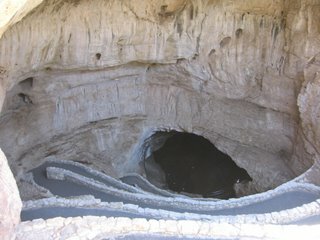 We dr ove to the cavern during a now practically chilly (compared to Roswell) 109 degrees. 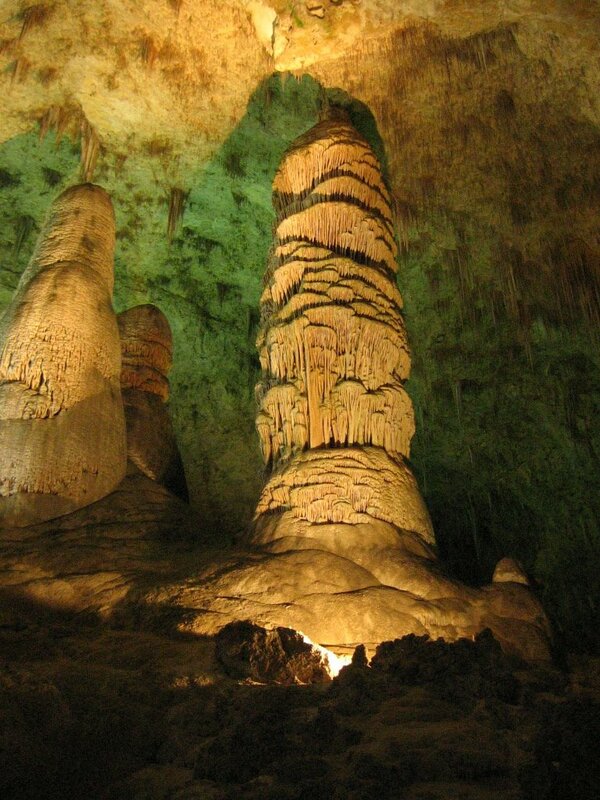 We arrived at the Carlsbad Caverns National Park visitor center, which stands over the cavern. A hot, dry desert wind gusted over the mountain top. We made sandwiches. The bread instantly grew hard and crusty in the hot wind, cutting the roofs of our mouths ala Captain Crunch. 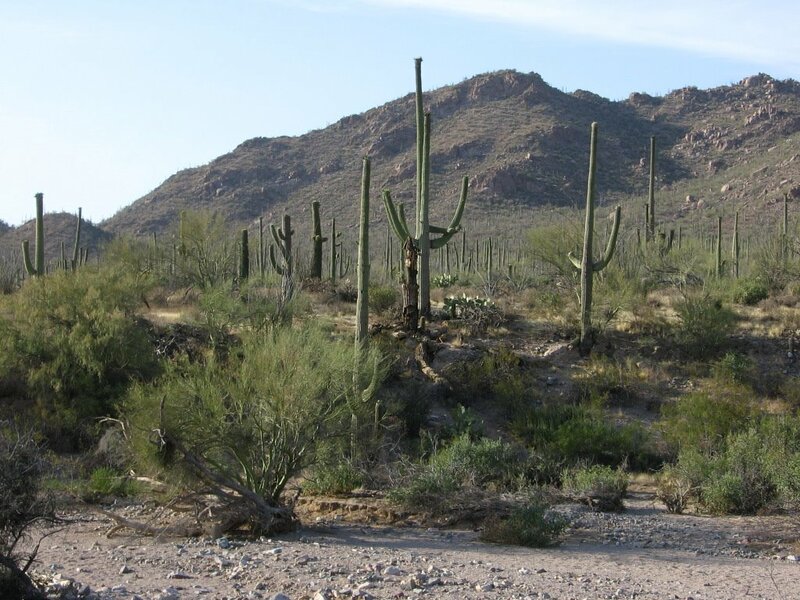 The desert here is a dry, dusty place with only patches of agave, sagebrush and no vegetation taller than your knee -- all tan and white, with hints of gray and dusty brown stretching into the horizon. At the base of this mountain on which the visitor center sits stretches an unbelievably flat plain all the way to the horizon. At night, this plain is as dark and flat as the ocean. Tiny lights from a few houses in the sea of darkness could just as easily be ships adrift on the placid waters. We secured tickets for the King's Palace Tour, one of several ranger-led tours available. The cave was a cool, dark 56 degrees. The ranger led us through room after room of towering stalagmites, columns, and draperies. Cavern ceilings soared above us. Never have I been in a more tremendous cave. 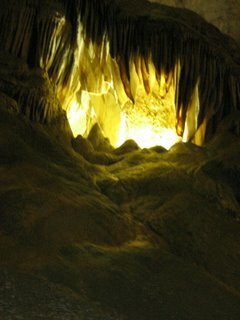 Water dripped in the vast hollows of the cavern. 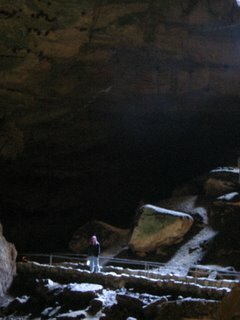 When we'd looped around, we continued on by ourselves, hiking through the "Big Room" portion of the cave. This is far more than a "Big Room," as it winds around for more than 8.2 acres through even more stunning rooms. 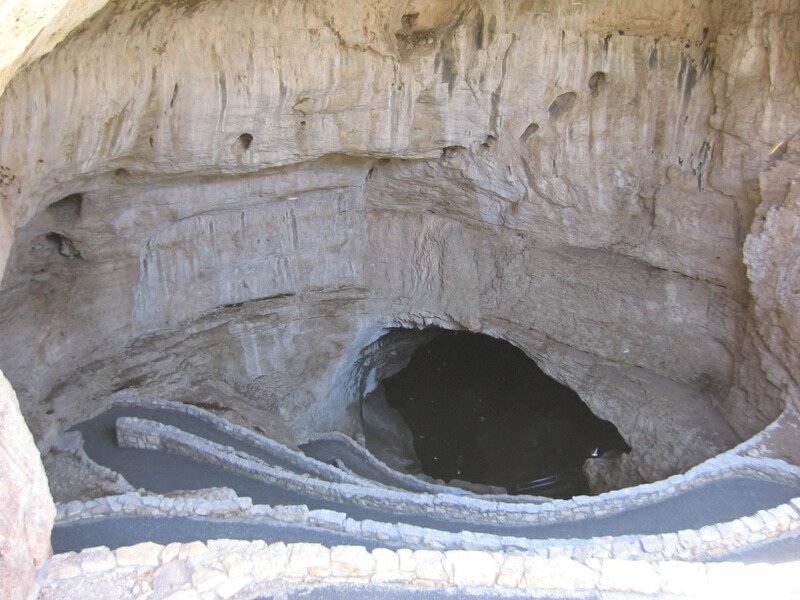 The viewpoint for Lower Cave dropped away ninety feet straight down. 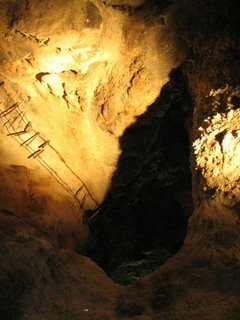 A wire and wood ladder from the late 1890s hung down into a dark hole leading to Lower Cave, evidence of the cave's early explorer, Jim White. We peered into the Bottomless Pit -- the portion of the cave that has the most vertical clearance. Reluctantly we emerged from this exploration, blinking into the bright daylight. We hiked out to the large Natural Entrance to await the famous mass exodus of the Mexican free-tail bats. The cavern is home to more than 600,000 Mexican free-tails, and they all stream out in a matter of minutes, creating an undulating black cloud in the purple desert sky. 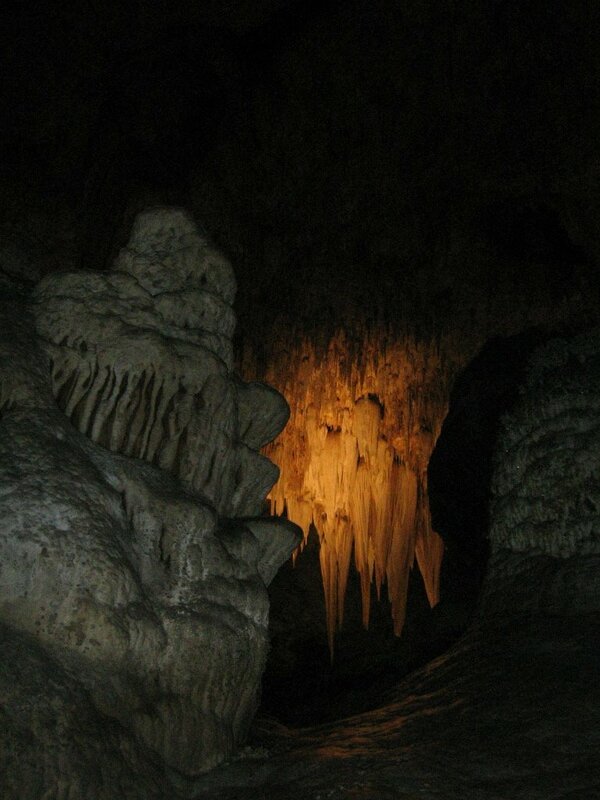 We heard a whoosh of wings, and suddenly bats began spiraling out of the large, black mouth of the cave. They must fly out in a spiral in order to get lift. 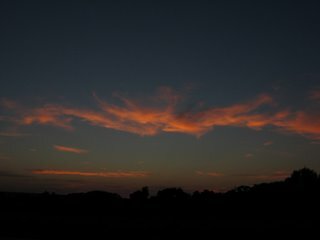 In a great outpouring they filled the sky, dipping and diving, already catching insects. We sat and watched until it grew too dark to see them, and still they poured out of the cave. They flitted and fluttered just over our heads. The stars came out, glittering and intense in the dark desert sky. We left Texas today, but not before driving through the meat capitol of the world, Hereford TX. Scores of depressed cows watched our car streak past. We crossed into New Mexico and passed through Clovis. 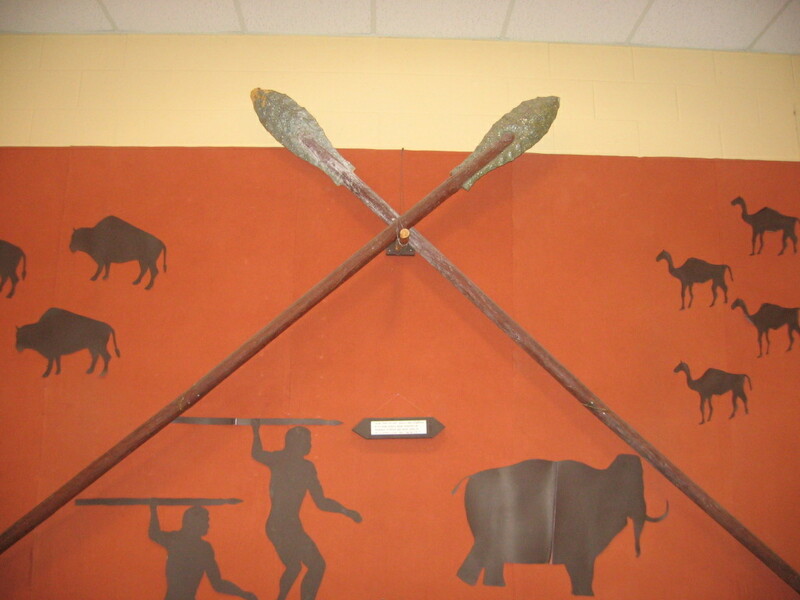 We stopped at the Blackwater Draw Museum, home to one of the biggest mammoth kill sites in North America. We examined mammoth bones, giant ground sloth remains, and studied Clovis spear points (from c. 13,000 years ago). During the ice age, megafauna stopped by this site for a bite to eat and a drink of water. Dire wolves, prehistoric camels, saber-toothed tigers and six-foot armadillos were among the patrons. 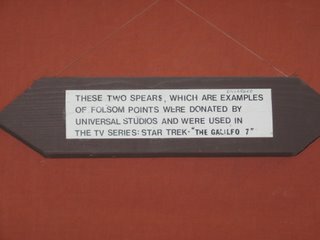 As is typical for every roadside paleontological museum, one room sported two giant spears used in the filming of the Star Trek episode "The Galileo 7." The terrain en route to Roswell NM was very uniform. Very very uniform. You are getting sleepy. Very sleepy. Clouds stretched lazily out into the hazy distance. You feel your eyelids growing heavier. Soft sagebrush dotted the uniform, flat unwavering terrain. Your limbs feel heavy. Your head dips forward a little. Part of this stretch, however, was the Woody Guthrie Memorial Highway, a fave musician of mine, and soon we saw several pronghorn antelopes grazing in the sage and felt revived. A sweltering 114 degrees greeted us in Roswell, or so a bank display read. We think it may have only been a mere 112 degrees, but it was like a wall of dry heat hitting us as we stepped out of the cool car. Our first glimpse of Roswell was positively alien-free. Where were the UFO cafes? Where were the stores full of schwa alien kitch? 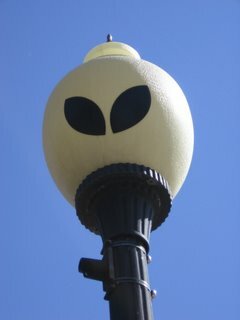 Just as we started to lament, we spied an entire city block of lampposts with huge almond-shaped alien eyes. This block extended into the next and the next. 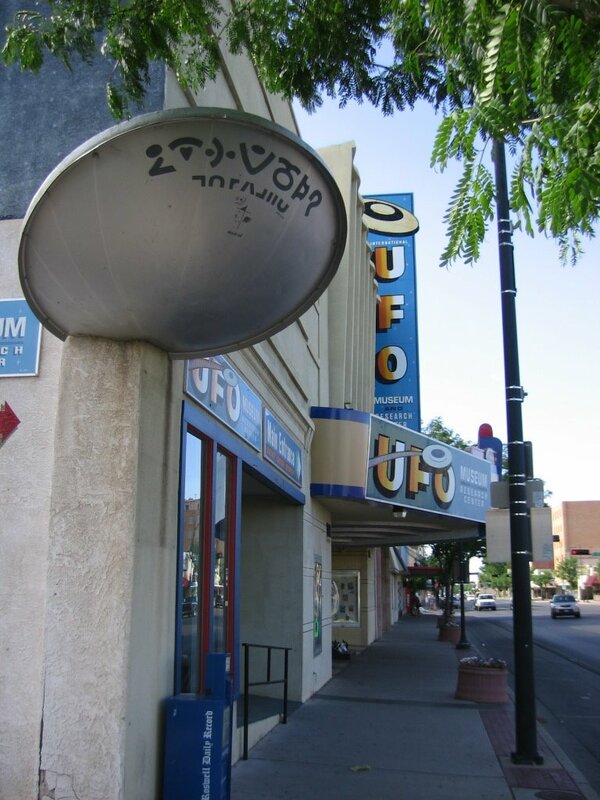 We parked and excitedly strolled the streets, reaching the International UFO Museum & Research Center. There we read up on the Roswell UFO crash of 1947. Hundreds of photographs, statements, and reconstruction of pieces of evidence, such as the thin metal pieces, "bakelite" style pieces, and the little "i-beam" piece found directly after the crash. The gift shop was wonderfully kitchy, with alien doormats, magnets, pens, sculptures, t-shirts, and inflatable extraterrestrials. We exited again into the heat. At a little store across the street, we paid $1 to spin a large metal UFO and won three paratrooper aliens and a deck of alien mini-playing cards. 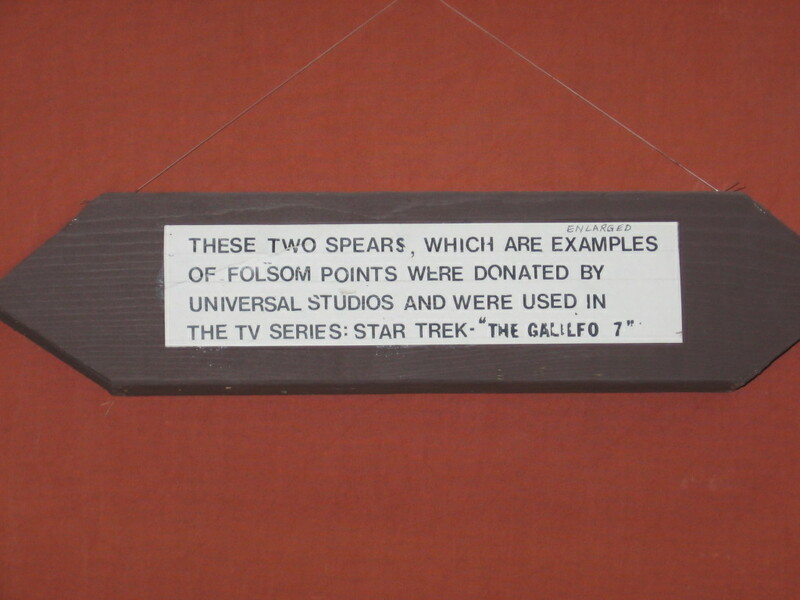 Aliens adorned tops of buildings, and many structures sported UFOs that had crashed into their corners or walls. We flew the paratrooper aliens while still in Roswell, so they could join in on the alien crashing fun. Another gorgeous sunset astounded us. At last we arrived in Oklahoma City, though we'd become convinced we never actually would. Our friends greeted us warmly, and we entered the cool haven of their air conditioned house (outside temperatures reached 98 degrees). Over dinner of stir fry, we talked of traveling, our families, and reminisced. After dinner, they showed us the happenin' part of town, and we drank tea and coffee at a local coffee house. We laughed and told stories new and old. At night, still balmy and warm, eighty one degrees, the wind sighed in the trees and clouds drifted by the moon. A bat swooped and flitted, and a train horn sounded in the distance. It was just like a warm summer night from my childhood, and I felt a sweet nostalgia as the crickets sang and the warm, pleasant wind lifted my hair. We drove to Norman, OK today to eat at a little Mexican food place near the University of Oklahoma campus, which was full of grand architecture. My friend showed us where she teaches, and I took action photos of her working at her desk to send to our friends. And we weren't the only ones in Norman that day...Sue, one of the most complete t-rex skeletons yet found was also there, at the Bizzell Memorial Library (well, at least an articulated replica of Sue was in attendance). We met up with more friends and discussed future filmmaking endeavors. After farewells, we left the city, again heading west. Luckily, we were assured that no more toll roads awaited us. The sun set fiery and red, a huge orb in a bed of crimson clouds. We crossed the Texas border by moonlight, seeing billboard after billboard advertising a free 72 oz steak if you could eat it in one hour. Also featured at the same location as the 72 oz steaks was the Horse Hotel (where you can stay free if you can eat the horse in one hour). We stayed in a place in Amarillo that modeled its design after the famous Dorm School of Decoration -- busted couches sulking in the hallway, stained chairs missing several legs or cushions and leaning precariously against walls, waiting to ambush the unwary traveler. Some kind of funk wafted in the room itself, smelling reminiscent of sweaty gym socks marinated in a light cheese sauce long past its expiration date. Toll Booth Personnel: "That'll be $5.75 to drive the 130 miles to Tulsa. What? You want to get off at the next exit for gas? Then take this refund receipt, and when you get off, they'll refund $2.51 of the $5.75 you just paid, and then you go back through the toll booth, down to the next exit and pick up a pink ticket to use when you come back through the toll booth on the other side." Us: "Where do we get the pink ticket?" Toll Booth Personnel: "Pink ticket. You'll need one." Us: "Yes, but where do we get one?" Toll Booth Personnel: "At the refund receipt $2.75 exit booth plaza exit receipt." It took us an hour and a half and $12.00 in tolls to get gas and get back on the road again, because we actually had to go back an exit. I am not kidding. We now know this is a very bad thing to do on a toll road. Basically, if you're on a toll road in Oklahoma, just don't ever get off. In Tulsa, where we had to exit for more cash for the toll roads, we got back on the entrance ramp for 44 west, only to be confronted with the choice of going left for 64 or right for 64 (no direction was noted in either case). No mention of 44. No mention of west. Just a 50-50 chance of guessing right. We didn't. "That'll be $5.75, please." Oklahoma employees get paid 45% above the national average just to be able to pay to get off the roads. Otherwise, they'd have to just drive and drive, never exiting, scores of nomadic Oklahomans joining the teeming hordes of naive visitors who were foolish enough to think that the $20,000 cash they cleared in the stock market last year would be enough to be able to exit the road. Perhaps this is actually what the ghost lights are -- aimless wanderers who haven't been able to afford exiting Oklahoma toll roads since 1881. By the time we reached the toll plaza for Tulsa to Oklahoma City, we needed Jean Luc Picard to translate for us. Us: "Will this toll get us all the way to Oklahoma City?" Toll Booth Personnel: "No, this turnpike ends in 47 miles, then you need either 35 or the Kilpatrick Turnpike starts." Us: "We just want 44 West." Toll Booth Personnel: "Turnpike at Tenagra. When the walls fell." On the first day of our journey across the western half of the country, we drove through the rolling hills of Missouri, rivers glinting in the sunlight, and shadows pressing into tree-filled valleys. After a vivid sunset of gold, blue and pink, and a stop for ice cream fortification, we drove on to Joplin in search of the mysterious Joplin Ghost Lights, also called the Hornet Light and the Joplin Spooklight. We'd never seen ghost lights before, and felt like paranormal investigators as we navigated the narrow roads, skirting fields and farms, and crossing over into Oklahoma by way of moonlit back roads. We'd done research before leaving, knew where to stop, where the ghost lights have been seen nightly since the 1880s or possibly earlier. 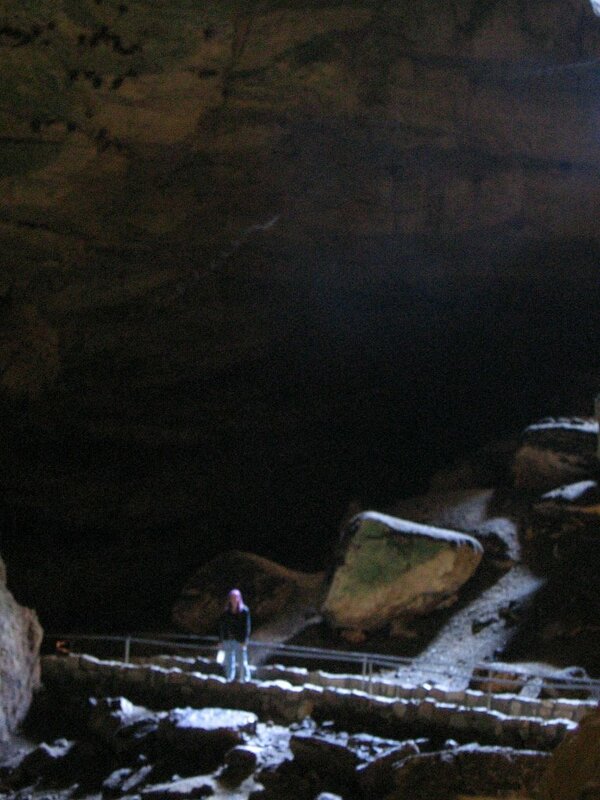 Geologists and ghost hunters alike have been puzzled by the strange lights. Swamp gas has been ruled out. We crested a small hill, seeing headlights in the very far distance from interstate 44, which people have confused with the spook lights in the past, and easily dismissed the lights as such. We were just searching the area much nearer us when we saw them-- abruptly appearing on the left hand side of the road -- an orb of green light which moved to one side and transformed its color to gold, then to red. then it winked out. Another orb appeared, this one gold, brighter. It shifted to one side, then it, too, went out. Both pulsed back into view, side by side, shifting sideways, then back. Then they disappeared. We continued down the road to an intersection, where three other ghost light seekers waited in lawn chairs, munching on chips and drinking diet cola. We joined them -- a friendly, enthusiastic grandfather out with his two grandchildren. We parked and stood on the desolate road, catching a glimpse or two of the green ghost light, far fainter this time than our first encounter. Around us coyotes began to howl in their eerie way -- yips and high pitched mewling and crying. Another group answered on the opposite side of us. In the distance came the mournful cry of a peacock, and a lone whip-poor-will sang in the darkness, which twinkled and shimmered with the light of hundreds of fireflies. All the while we waited for the reappearance of the ghost lights. Midnight approached, and we walked back to the crest of the hill where we'd first seen the lights, this time accompanied by a local dog who trotted along companionably and occasionally barked at the howling coyotes. As we waited, the dull roar of an old truck thundered up the road, and it drove past us, headlights out, with several people standing in the flatbed, staring silently at us as they passed, trolling for ghost lights. At last, as the moon peeked through the trees and the frogs sang in the marshy field behind us, we had to press on, glad we'd seen the mysterious ghost lights.